Domaine Faury is one of the region’s most artisanal producers. When Philippe Faury took over the domaine in 1979, the family was selling wine, peaches and cherries, and the bulk of their clientele was local. Over the years, Philippe expanded their holdings to over eleven hectares, and expanded sales to an international client base. In addition, he has shared his savoir faire with his son, Lionel. Unlike many other vignerons in the region, the Faurys have a strong aversion to new oak. 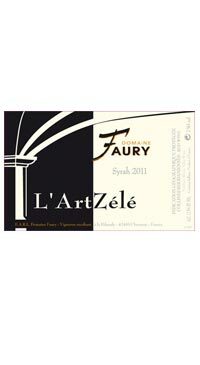 Faury crafts exceptional wines from one of the Northern Cote du Rhone’s most artisinal producers. The grapes are grown on predominantly granite soils and undergo partial de-stemming, soft crushing and temperature controlled fermentation to assure a fresh and lively wine style. The wines are unfined and lightly filtered just before bottling which ensures maximum flavour and elegance. The vines are planted on a plateau 850 feet above sea level and 150 feet away from from the prestigious AOC Côte Rôtie vines in the Northern Rhone. The wine is made using daily pump overs and punch downs for extraction and vinified in open, temperature controlled cement vats then aged for 15 months in 5 to 15 year old demi-muid.